In cities and towns across the world, feral cats roam unnoticed, with generation after generation making their way through gritty lives filled with disease and hardship. When photographer Knox began noticing the growing colony of cats in the alley behind his recording studio, he entered a complex world of feline families struggling for survival. In many ways brutal, this world, he discovered, was also filled with strong family bonds, intriguing personalities, and real emotion. 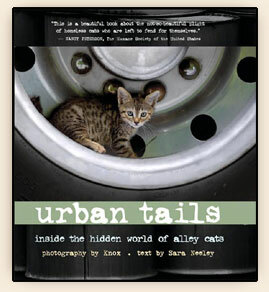 Urban Tails, featuring Knox's striking images and Sara Neeley's lively text, celebrates these survivors at the intersection of nature and industry and documents the authors' rescue operation to trap, neuter, and return them to their original environment. Urban Tails is a powerful testament to such operations, giving readers a glimpse into a hidden world of lives that, while not ideal, can be filled with beauty and love. "This is a beautiful book about the not so beautiful plight of homeless cats who are left to fend for themselves." "How to resolve the feral cat problem is one of the most debated issues in animal welfare today. Urban Tails is a thought-provoking book that utilizes powerful vignettes to depict the precarious lives of cats that are neither wholly wild nor tame and the heartbreak their caretakers endure when their charges lose their battles against the cruel forces of man and nature." Knox is an acclaimed photographer known for his dramatic, gritty, and realistic visual take on street life. He has also worked in the music business for the last thirty years in New York City and Atlanta, where he now lives. His websites are www.avatarphotoart.com and www.urbantailsbook.com. Sara Neeley, a freelance writer and former English teacher, holds a master's degree in English literature. She lives in Atlanta.